Intravenous infusions of lipid emulsion hold considerable promise as broad spectrum interventions for drug overdose, but one can have too much of a good thing. Very high doses of lipid present their own complications, and our current understanding of lipid interventions is largely limited to reversal of acute heart failure in the case of a rapidly absorbed toxin. The corresponding rates of IV delivery are likely not appropriate for treatment of oral overdoses where absorption of the cardiotoxin is prolonged. See the article at Annals of Emergency Medicine. 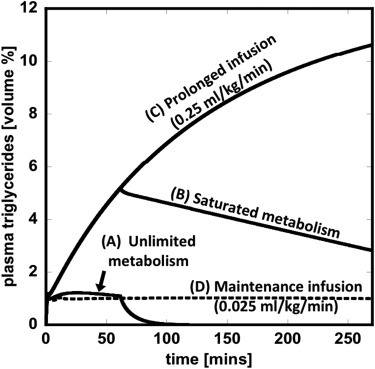 tl;dr version: physiological models demonstrate the dynamic coupling of lipid metabolism with circulatory transport to explain why generic application of a fixed rate of infusion is potentially dangerous. Posted in News on March 1, 2015 by Belinda.